Pi Patel (Suraj Sharma) and a fierce Bengal tiger named Richard Parker must rely on each other to survive an epic journey in "Life of Pi." "Life of Pi" is one of those lyrical, internalized novels that should have no business working on the screen. Quite possibly, it wouldn't have worked if anyone but Ang Lee had adapted it. The filmmaker who turned martial arts into a poetic blockbuster for Western audiences with "Crouching Tiger, Hidden Dragon" and made gay cowboys mainstream fare with "Brokeback Mountain" has crafted one of the finest entries in his eclectic resume in "Life of Pi," a gorgeous, ruminative film that is soulfully, provocatively entertaining. Lee combines a lifetime of storytelling finesse with arguably the most artful use of digital 3-D technology yet seen to bring to life Yann Martel's saga of an Indian youth lost at sea with a ravenous Bengal tiger aboard his small lifeboat. It's a delicate narrative with visceral impact, told with an innovative style that's beguiling to watch and a philosophical voice that compassionately explores how and why we tell stories. Our playful, not-always-reliable narrator here is Pi Patel, played by newcomer Suraj Sharma as a teen and as a grown man reflecting back on his adventure by Irrfan Khan. As a youth, Pi, his parents and brother set out from India, where the family runs a zoo in a botanical garden, to Canada. Pi's father brings along some of his menagerie on their voyage, including a tiger named Richard Parker with which Pi had a terrifying encounter as a boy. Their ship sinks in a storm, with Pi the only human survivor aboard a lifeboat with an orangutan, a hyena, a zebra with a broken leg and Richard Parker. Survival of the fittest thins their numbers into a life-and-death duel and eventually an uneasy truce of companionship, between Richard Parker and Pi. This could be a one-note story - please Mister Tiger, don't eat me. Yet Lee and screenwriter David Magee find rich and clever ways to translate even Pi's stillest moments, the film unfolding through intricate flashbacks, whimsical voice-overs, harrowing sea hazards and exquisite flashes of fantasy and hallucination. 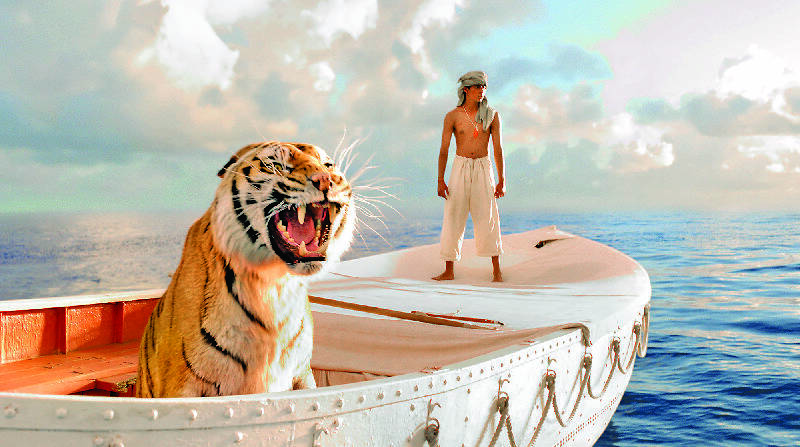 Lee used real tigers for a handful of scenes, but Richard Parker mostly is a digital creation, a remarkably realistic piece of computer animation seamlessly blended into the live action. The digital detail may be responsible for most of Richard Parker's fearful presence, though no small part of the tiger's impact is due to the nimble engagement of Sharma with a predator that wasn't actually there during production, a task hard enough for experienced performers, let alone a youth with no acting experience. Digital 3-D usually is an unnecessary distraction not worth the extra admission price. In "Life of Pi," like Martin Scorsese's "Hugo," the 3-D images are tantalizing and immersive, pulling viewers deeper into Pi's world so that the illusion of depth becomes essential to the story. Not all of the images live up to Lee's digital tiger or 3-D wizardry. Water is notoriously hard to simulate through computer animation, and the waves crashing down around the sinking ship or tossing Pi's lifeboat about have an unfinished, cartoony look. Still, Lee more than compensates with a world of visual wonders, from the simple image of a swimmer framed from below as though he's stroking his way across the sky to a mysterious island populated by a seemingly infinite number of meerkats. The rest of the cast is mostly inconsequential, including Gerard Depardieu in a fleeting role as a cruel ship's cook. The other people in Pi's life are filtered through this unusual youth's eyes, each of them catalysts in the development of his deep spirituality, which blends Hinduism, Christianity, Islam and other contradictory influences into a weirdly cohesive form of humanism. Like Martel's novel, the film disdains our inclination to anthropomorphize wild animals by ascribing human traits to them and then turns around and subtly does just that. Friendship cannot possibly exist between a hungry tiger and a scrawny kid alone on the open water, yet for that boy, if not the cat, the need for togetherness, some commune of spirits, is almost as strong as the need for food and water. The ways in which Lee examines the strange bond between Pi and Richard Parker are wondrous, hilarious, unnerving, sometimes joyous, often melancholy. Pi's story may not, as one character states, make you believe in God. But you may leave the theater more open to the possibilities of higher things in the life of Pi and in your own.